Many critics of the raw food movement claim that it is harmful to eat raw crucifers. 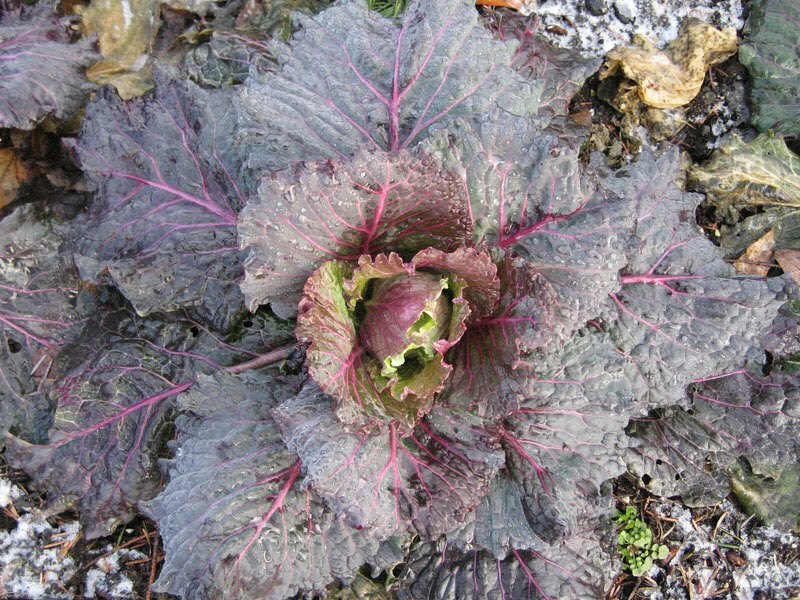 The crucifer family which is now called "Brassicaceae" covers the largest group of veggies that people eat. Root crops include radishes, turnips and rutabagas, as well as wasabe and horseradish, two root mustards. 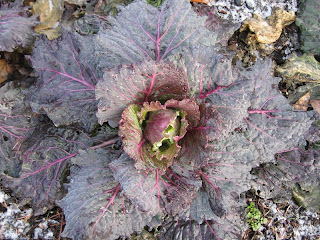 Leaf crops include cabbage, kale, Chinese and Japanese cabbages and kales and mustards, and hundreds of leafy greens that are wild or semi-wild like arugula, cress, and rocket. Edible flowers include honesty and dame's rocket. We even eat the seeds in the form of mustards, and the oil. 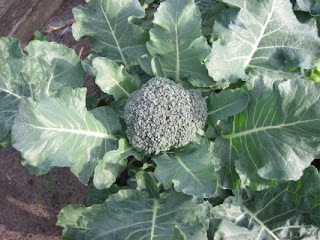 But the queens of this family include broccoli and cauliflower and all the crosses in between. Why do people discourage eating raw crucifers? Because they contain goitrogens, substances that suppress the thyroid, causing its enlargement in the disease called goitre, which the USDA fights by putting iodine in table salt. Other foods that suppress the thyroid in their raw state are soybeans, pine nuts, peanuts, millet, strawberries, pears, peaches, bamboo, spinach and sweet potatoes. The goitrogens are deactivated by cooking. Worse yet, foods containing goitrogens in combination with caffeine, are thought to cause thyroid cancer. So people who cut back their salt and start eating raw cabbage, broccoli and arugula on their salads, not to mention fruits, must be aware that they are suppressing the thyroid. There is an easier solution. Table salt is very toxic to the body. It is bleached and treated so that it is more poisonous than is considered to be healthy, even in small amounts. However, people do need salt. Often people go overboard and do not get enough sodium in their diets. The ideal is to get a balance of potassium and sodium. If you get leg cramps, have low blood pressure or high, have headaches, and generally feel fatigued, it is probably because you have a salt imbalance. The ONLY salts that are worth eating are sea salts and mineral salts that have not been bleached or otherwise treated. They are expensive, yes, but you do not need to use a lot of salt. If your food tastes good, you can easily cut back on salt. A better way to deal with the problem is to look at a whole food solution. This is another controversial food. Some raw foodists scorn seaweed because of the sodium content. This is silly. If you eat a vegan diet you may not see much in the way of sodium at all and that is bad. This is Malcolm and Nutmeg from the Touchwood Project in Scotland, showing you what seaweed looks like out of the package. 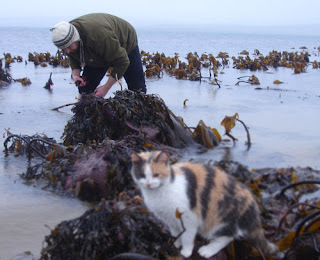 Nutmeg is an unusual cat, not minding the wet and cold, and I tell you, this water is COLD! Seaweed is one of nature's wonder foods. What is totally ironic is that seafood and seaweed have been scorned in the British diet because they are associated with famine and poverty. Rich people eat salt beef and white bread, not shellfish or seaweed! Much of the tragedy of the Irish Famine could have been averted if the Irish had the fishing traditions of their Norse cousins. Scotland has much more of a sea tradition being closer to their Viking and Celtic fishing roots. Seaweed is fabulous fresh and raw, crunchy, juicy, and sometimes a bit hard to eat. But most seaweeds favored by people are delicious. They are treated in all kinds of ways, some of them cooked, but most of them dried. It is easy nowadays to get seaweed if you are inland; yes, it is expensive, but you don't need much of it since it is full of minerals and vitamins even when dry. It also soaks up to ten times the dried size. Sometimes people try out seaweed salad in the Japanese restaurants. This is usually not seaweed, but a seaside plant called "salsola", related to tumbleweeds and beets. It is stripped and cooked. What you see here are the stems, called "land seaweed" in Japanese. It is good, but not raw and not seaweed. 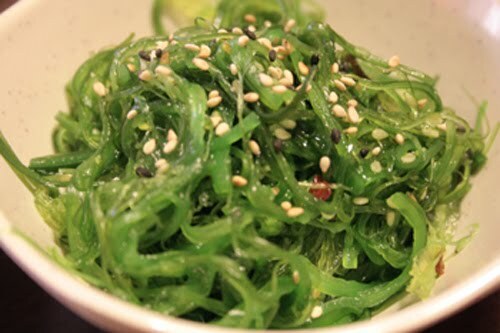 There are a number of seaweeds to try: nori, arame, hijiki, wakame--the list is endless. I like to eat cold water seaweeds from Europe, grown here locally, such as dulse, kelp, and bladderwrack, which you see in the picture above with Nutmeg. I can't say enough good things about dulse, a red seaweed, and I use kelp granules instead of salt for flavoring everything from crackers to salad dressings. BUT, you can overdo seaweed, too. People caution against too much sodium and too much iodine leading to hyperthyroidism, the opposite of goitre. So, balance, balance, balance. If you like raw crucifers, pine nuts and strawberries, eat seaweeds to balance the iodine levels. Next time you want to eat raw broccoli, be smart, eat it with some dulse. The good news is that hypothyroidism is very often the result of low iodine in your system, which can be corrected with iodine supplements for thyroid that are easy to access and use.